The objective of this lab is to determine the molecular mass of a substance. 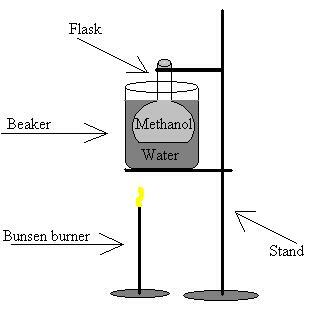 1)	Q:	What does the flask contain before adding the liquid, when the liquid has vaporized, and during the final massing. A:	Before adding the liquid, there was only air from the room; after the liquid had vaporized all of the air had been completely displaced, leaving only methanol; At the end, there was methanol vapor, methanol liquid, and air. 2)	Q:	Why is the temperature of the boiling water used in the calculations instead of the room temperature? A:	The temperature of the water is the temperature of the gas when it has completely filled the container, after it has cooled, it no longer completely fills the container. 3)	Q:	When vaporized, the liquid does not behave like an ideal gas, what direction would the deviation be expected, and what impact would it have on the molecular weight? A:	The gas would probably be more expansive than the ideal gas law causing the calculated molecular weight to be lower than the actual molecular weight. 4)	Q:	What are the restrictions would the liquid used for this lab be? A:	First, it has to be able to vaporize below the boiling point of water, second, in it's vapor form, it has to be heavier than air as to not escape. From this lab it is determined that the molecular mass of methanol is 25.4g/mole. This value contains 20.6% error from the actual scientific value of 32.0g/mole for methanol. This large error is the result of water vapor introducing it's self into the system as well as air it's self.